Rediscovered and Restored - Slapstick | Bristol's Silent Comedy Festival. The days of watching old flickering images from faded silent film prints are almost gone. In their place comes the glorious parade of meticulously restored prints from the world’s finest film archives. 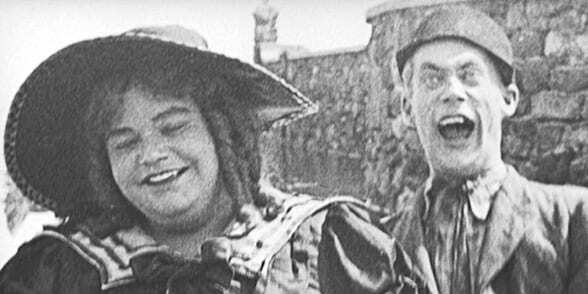 Witness the talents of one of Europe’s finest silent film champions Serge Bromberg as he presents his latest collection of newly discovered and restored silent comedy shorts to open Slapstick Festival. A renowned film archivist and historian, and co-founder of Lobster Films, Serge has helped restore hundreds of rare silent films and here he presents their most recent discoveries. Serge will delight and entertain as he reveals and accompanies newly restored versions of classic and rare films from Charlie Chaplin, Buster Keaton, James Finlayson and Charley Bowers. A rare and wonderful insight into restoration and an opportunity to view great silent comedy from the finest material available.